Home Lifestyle Health & Fitness Pancreatic cancer, a silent killer? Seven years ago today, Matt Wilson went to the emergency room. He had stomach pain, which he assumed was a kidney stone. It was not. His CT scan showed an abnormal spot, later diagnosed as early pancreatic cancer. That chance discovery may have saved his life. Pancreatic cancer usually grows silently, without symptoms, and successful treatment is rare. Thursday is World Pancreatic Cancer Day, in the hope that awareness about the disease can help save lives. The pancreas, an organ in the abdomen, is responsible for the secretion of digestive enzymes and hormones which regulate metabolism. Pancreatic cancer is the third leading cause of cancer deaths in the U.S. — it may even surpass lung and colorectal by 2020. The lifetime risk of developing this cancer is 1 in 63 for men and 1 in 65 for women; the risk increases with age. Almost 90 percent of people diagnosed are over 55 years old. Other risk factors include a family history of cancer, obesity, smoking, diabetes, and a diet high in red and processed meats. A diet that includes plenty of fruits and vegetables may work to decrease risks. Matt Wilson with his surgeon, Dr. Harish Lavu from Jefferson University Medical Center. Most people who are diagnosed, including Matt Wilson, only display vague symptoms at first: abdominal or upper back pain, unintentional weight loss, fatigue, a recent diabetes diagnosis, or jaundice (yellowing of the skin and eyes). Because these symptoms apply to lots of diseases, the cancer is often times diagnosed too late for meaningful treatment. There’s a frightening 9 percent survival rate 5 years after diagnosis. This year alone 55,440 people will be diagnosed, and 44,330 will die. There are two major types of pancreatic cancer: endocrine and exocrine tumors. The most common and most aggressive form is the exocrine tumor. That is an adenocarcinoma that begins in the pancreatic ducts and gland cells, which produce enzymes. These cells have a thick coat to protect them from the digestive enzymes they produce. But that thick coat also reduces the effects of chemotherapy. Just a few cases of pancreatic cancer – about 1 percent — are endocrine tumors. They affect the cells that produce insulin and glucagon, the hormones that manage our blood sugar. These cancers have a significantly increased survival rate 5 years after diagnosis of about 50 to 80 percent. The gold standard treatment option is a surgical procedure known as the Whipple. This technique was coined by Dr. Allen Whipple back in 1935 at Columbia-Presbyterian Hospital in New York City. Doctors remove many of the digestive organs: the gall bladder, common bile duct, part of the stomach, and the pancreatic head. Unfortunately, that procedure is only possible in about 20 percent of patients; it can’t work with patients who are diagnosed with cancer in a later stage. Other treatment options include chemotherapy, a host of medicines designed to kill cancer cells. This may be done after the Whipple or along with radiation for those who aren’t eligible for the surgery. Treatment is difficult because it’s so hard to diagnose pancreatic cancer when the tumor is small. When it enlarges and obstructs pancreatic ducts or produces abnormal levels of hormones, it is often too late for surgery. Pancreatic transplants, another treatment option, has also caught on recently. That’s what Steve Jobs used, in part, to battle his disease. However, doctors warn that steps taken to stop the body from rejecting the new pancreas can allow remaining cancer cells to grow, and that means a high risk of the cancer coming back. “An oncologist will likely have to rely on both the science and the art of medicine to help a patient determine the treatment that is the best choice for them,” Lynn Matrisian Ph.D., chief science officer for the Pancreatic Cancer Action Network, told ABC News. 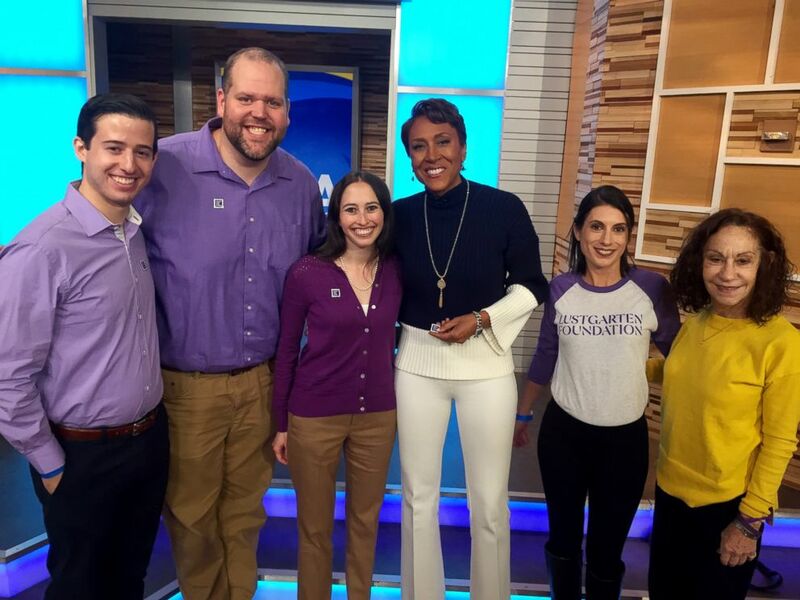 Matt, second from left, with ABC News’ Robin Roberts and employees from Pancreatic Cancer Action Network and the Lustgarten Foundation for Pancreatic Cancer Research, visiting Good Morning America in honor of World Pancreatic Cancer Day. Can’t we screen for pancreatic cancer the way we do for breast cancer? The International Cancer of Pancreas Screening Consortium recommends that people with hereditary pancreatitis, those with first-degree relatives who have been diagnosed, or those with BRCA1/2 mutations should be screened by doctors more closely when they come into the office with vague stomach pain. Unfortunately, no other specific guidelines exist. Matt, the ER patient, had surgery that removed part of his pancreas, spleen, and more than 20 lymph nodes. A challenging recovery and discovering a new cause means that Matt now splits his time as a university professor and advocate for others with the same diagnosis. He’s now part of the Pancreatic Cancer Action Network. Organizations like the Pancreatic Cancer Action Network are constantly working to urge further funding to find out what may work against this aggressive cancer. They’re also researching biomarkers for a blood test that could help diagnose it early. At this point the tests remain unreliable, but perhaps further research can open new doors. Drug therapy targeting specific DNA mutations may help create drugs that better penetrate the tumor cells. But sadly, those screening tools will take years to develop. Dr. Sumir Shah, M.D. is an emergency medicine physician at NewYork-Presbyterian Queens/Weill Cornell Medical Center in New York City, and a member of the ABC News Medical Unit.